New Zealand coach Steve Hansen with Sam Cane. 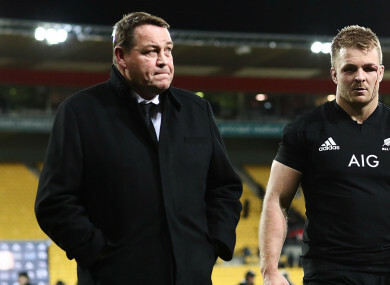 STEVE HANSEN WAS in no mood to be “bitching” about a late refereeing call in New Zealand’s shock Rugby Championship defeat to South Africa and admitted his side deserved to lose. The All Blacks would have defended the title with two rounds to play had they secured a bonus-point victory, but made a host of uncharacteristic errors as the Springboks withstood a late onslaught to win a Wellington thriller 36-34. Hansen stated in his post-match news conference that he heard a call saying two South Africa players were offside in the closing stages of a breathless contest. But the head coach added that referee Nigel Owens would have made the decision had he heard it. “I just heard the same thing you did, obviously Nigel didn’t hear it or he would have done something about it,” he said. “No point in me bitching about that, the game’s about taking your opportunities and making sure the opposition don’t. “We didn’t do that, so the result is a credit to South Africa. “I thought they played particularly well and we’ll come out of it with a lot of things to work on. Star fly-half Beauden Barrett had a rare off day, missing four conversions, including two sitters for a player of his calibre in the second half. Had Barrett nailed those kicks the outcome would have been different, but Hansen refused to play the blame game. “Goalkicking is a really difficult job,” he added. “Tiger Woods hits a good golf ball but now and then hits a bad one. It’s part of our sport. Email “Hansen not 'bitching' about ref call in All Blacks' shock loss”. Feedback on “Hansen not 'bitching' about ref call in All Blacks' shock loss”.